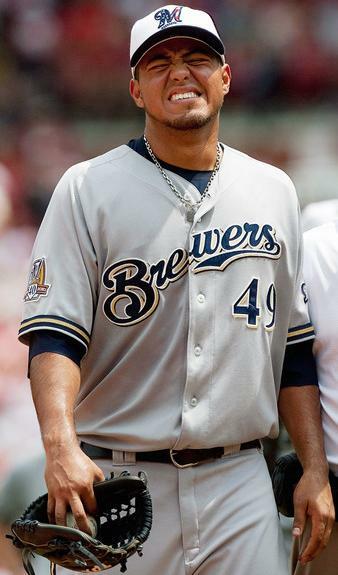 The Brewers' 24-year-old ace had a worse day than you yesterday even if you mistook the liquid paper as creamer and spent the afternoon in the bathroom. Yovani Gallardo is actually having his best season in his young career with a 3.50 ERA, a .299 FIP and 9.97 K/9. He also inked a 5-year, $30 million extension earlier this year. Everything was coming up Yovani until yesterday. Gallardo spent 6.1 innings getting lit up by the Dodgers to the tune of 6 runs on 8 hits. He did manage to strikeout 10 and only walk 2 but the ERA damage was done. This would also be the high point of his day. Gallardo and a clubhouse attendant were robbed at gunpoint hours after the game in a grocery store parking lot. That Milwaukee is just incorrigible with all of its armed robbery and gang violence. Luckily nobody was seriously injured so I don't feel bad about making light of the situation. And isn't that all that matters, that I don't feel bad? The armed man, still on the lamb, approached Gallardo and the attendant in the parking lot and demanded cash and jewelry. The attendant, Alex Snachez, was hit in the head but didn't suffer a serious injury. I couldn't find any details on the amount of cash or jewelry that was stolen. Early wild and careless speculation indicates a watch with a diamond encrusted face the size of a baby's head and a gold rope chain with a Mercedes ornament hanging from it were among the items lost. This never would have happened if they weren't a on midnight run to pick up 4 dozen vegetarian Hot Pockets for Prince Fielder. This happened in Milwaukee, not LA.